I was going to write an article about commuting to work as I do just that, every day on my RT, because I don't have a car and because I can. There's a lot more traffic here in the Phoenix area than Des Moines, although not nearly as much as New York. Anyway, it's a challenge at times and I thought I'd write about it, you know, the agony and ecstasy of getting from point A to point B, but then we had Bike Week in Arizona. Arizona Bike Week is something new to me. I moved to Arizona last June and by that time, Bike Week had already passed. This year marks the 17th year that Bike Week has been in Arizona. They expect to draw 60,000 "bikers" this year, so while it's not Daytona or Sturgis, it is a fairly big event and one that draws decent musical acts and lots of tradition biker events. This year, on the final day, "Opie" and "Bobbie" from the television show Sons of Anarchy were leading a ride from Arrowhead Harley Davidson to the Cyclefest event center in Scottsdale to raise money for Crusaders for the Children. Not being a "biker" and not particularly interested in Arizona Bike Week, I didn't know this...Until today. 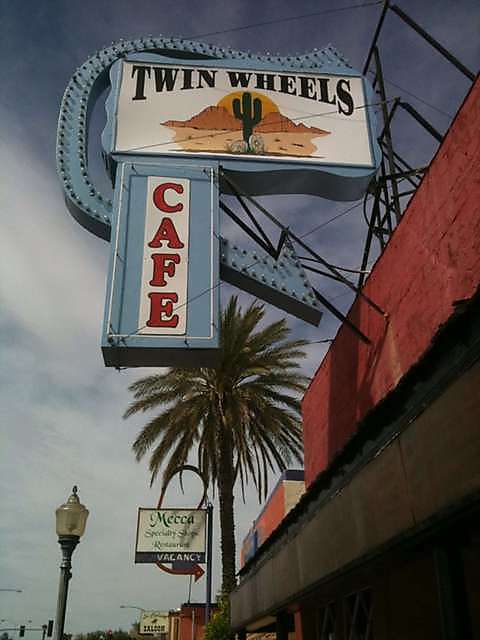 This morning, I went on a breakfast ride to Wickenburg, where we at at the Twin Wheels Cafe. I had Been there before with the Phoenix Motorcycle Riders Group and it's a favorite with the motorcycle bunch. I like the place, but for some reason, whatever I have ordered in the past, it seems to be less attractive than what my table mates get. I hate when that happens, but the real eye opener happened on the way home. On the way back from Twin Wheels, I got on the 101 North, figuring a nice quick trip home across the valley when I hit traffic, and I am not talking heavy traffic, but stopped dead in your tracks traffic. Fearing the worst, I got off at Thunderbird and proceeded to get on again as the traffic looked minimal. The first clue should have been the traffic cop that was leaving the intersection of the off/on ramp. 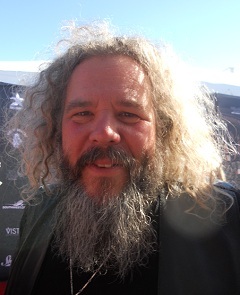 Actually the first clue was Tony or Troy at breakfast saying there was a ride at Arrowhead Harley Davidson, with some cast members from Sons Of Anarchy leading the pack. The third clue was running into the tail end of the ride in the HOV lane. I quickly hit the left lane and started to make time on the ride, heading towards the front. It took me from W. Bell Rd on the 101 to Hayden Rd in Scottsdale to come within a half a mile of the lead. I got off on Hayden as traffic was being blocked for the Parade of Elephants. The phrase "Parade of Elephants" doesn't do justice to the caravan I witnessed as I rode by. It was like a combination of a 10 mile procession of elephants led by Hannibal over the Alps and unseen footage from Road Warrior, but with better looking bikes. As I rode up on the formation and by it, I was almost nauseated if not asphyxiated by the maladjusted fuel mixtures on some of the bikes. I have to wonder if the first requirement for owning a Harley Davidson is to reprogram the computer to achieve the exhaust emissions of a Union Pacific 4-8-8-4. I had visions of Michael Bloomberg in apoplexy and respiratory distress if he had to drive behind this extended SOA entourage. No 64 ounce cup of Pepsi Max would be able to break him out of it. Thank god he doesn't live here in Arizona. He'd have these chaps rounded up and shipped out in no time. Then again, may be if he did live in Arizona or was visiting here and had a fit, he'd be tarred, feathered and rode out on a rail. I favor the latter. I decided it was best to jump off at Hayden as there was no way I was going to get to the head of the pack to see the dilettantes of motorcycle stardom as I wanted to stop by GOAZ BMW and take a gander at the new R1200GS, which is a whole new design. Before I get ahead of myself, I want to say that I am in no way "looking down" on anyone. We all have our perceptions and opinions. I am sure some look at BMW riders and wonder if they keep Grey Poupon in the glove box and if the bike comes with a portable espresso maker. 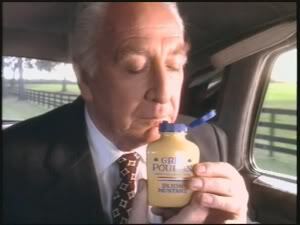 I don't know about the Grey Poupon, but I do know of a BMW rider that carries an espresso maker. It really is all in fun and I'd own a Harley in a minute if I could afford a second bike. Believe me, no one escapes my deprecating eye, including myself. That said, I have mixed feelings from just looking and sitting on the new GS. It really looks like and feels like it would be very nimble. I just didn't get the feeling of quality about it though. The switchgear seemed cheesy and cheap and overall I it seemed to have the look and feel of a plastic toy. Time will tell how it will hold up, but on paper, it hits all the right notes. I just don't know if I'd spend 19K+ on one. I looked at the GT and GTL too. I've seen them before and I have to say the GTL is not a direct competitor of the Goldwing. It's a different kind of bike. Looking at the pillion position and amenities or lack of them, the GTL is a GT that wants to make believe it's a full boat touring machine. It isn't. The GT on the other hand is to the RT what the Incredible Hulk is to Dr Bruce Banner. I just love the bike, but the price tag is heart stopping for a sport tourer, but it's an awesome bike. Now that I am home and Bike Week is over, I contemplate going back to work tomorrow. The commute awaits and so does my article on commuting. Stay tuned, I'll get to the commute next time. Well doesn't that sound like an interesting jaunt. Luckily we don't have any events that big here in Oregon. We have the Vintage Motorcycle ride which will see over a hundred bikes, but that is about it for large groups. I never liked big group rides for the reasons you said, the accordion effect and because of that, it ends up limited to the lowest common denominator. Groups shouldn't be bigger than 10. After that, it starts to get stupid quickly if a steady speed isn't maintained.